Before the ink was dry on the September 22, 2018 Vatican-China secret agreement, the Chinese government initiated its demolition derby by targeting Christian churches and their faithful. The Chinese Communist Government thugs ratcheted up a coordinated pogrom of demolishing, seizing, and closing Christian Churches. The first targets for destruction by the authorities were two Catholic Marian shrines in Shanxi and Guizhou. Government goons stripped crucifixes from church facades, and began to round up and imprison faithful underground Catholics, priests and bishops. Leave it to the Chinese to monetize their terror campaign: The government is offering cash for neighbors to spy on churches. Some detente, Pope Francis! No wonder the details of the deal are still secret. The three-part deal sought to clarify the manner of episcopal appointments, with the atheistic regime appointing bishops that were then approved by the Vatican, the status of the seven illegitimate bishops and the future of the faithful “underground” Catholic Church. Incredibly, the Vatican agreement with China allows the communist-controlled Chinese “Catholic” Patriotic Association (CPA) to nominate Catholic bishops and instructs the Underground Church to unite with it. Alone and undeterred, Cardinal Zen battled, cajoled, pleaded with the Vatican not to sign an agreement with the Chinese Communist government. Zen warned the Vatican and the Catholic world that the Chinese Communist government would step up its persecution of the Catholic faithful, once the deal was signed. Sure enough. Xi’s government thugs brought out the wrecking ball, razing churches, arresting faithful priests and bishops and initiating its unique Communist reign of terror on Christians. Zen alerted his faithful priests and predicted that persecutions would begin if the Vatican signed a deal with the ChiComms. Zen accurately described the Vatican deal as “suicide” and a “shameless surrender” to the Communist Government. As if on command, the devastation predicted by Zen has begun. Yet, the Vatican remains stonily silent and issues no protestations. The Vatican clearly got played, badly played by the Communist Chinese. Not only did the Vatican cede its spiritual authority to an atheistic, totalitarian, brutal regime but, in so doing, it seriously endangered the faithful underground Catholic Church of 6 million Chinese Catholics. The ruthless Chinese Communist government surely detected Vatican weakness during the negotiations, thus setting the stage for its dechristianization demolition. The world is now witnessing a brutal assault, an open season on the practice of Christianity in China. Early in his pontificate, in June of 2013, Francis launched his Vatican-Sino rapprochement by dispatching Cardinal Ted McCarrick to China. McCarrick proved to be a curious and troubling choice. Although Francis was informed of McCarrick’s reputation as a notorious sexual predator, he sent him anyway. Francis wanted access and McCarrick would open the doors for the Vatican negotiations with the Chinese government officials, who knew Cardinal McCarrick since he had visited China often. McCarrick described himself as “a habitual visitor” to China. He boasted that he was friends with high level Chinese government officials. No doubt, the Chinese intelligence service took special note of this compromised papal envoy. McCarrick was someone they could work with, based on his friendship and sympathy toward the ChiComms. Curiously, speculation has recently been raised by Catholic media that McCarrick was a long-time Communist agent. In February 2016, McCarrick would return to China again at the behest of Francis to continue negotiations with the Communist Party. According to the Global Times, over his episcopal career McCarrick traveled to China at least 8 times. In a 2016 interview with the Global Times, McCarrick gushed over the Pope and President Xi. “This Pope loves China. He has said this on many occasions. He really seems to be enthusiastic about China and that's wonderful. I would hope that it [Pope Francis visiting China] would be possible. I think China would be very open to it. I think the present government of China would be open to it. 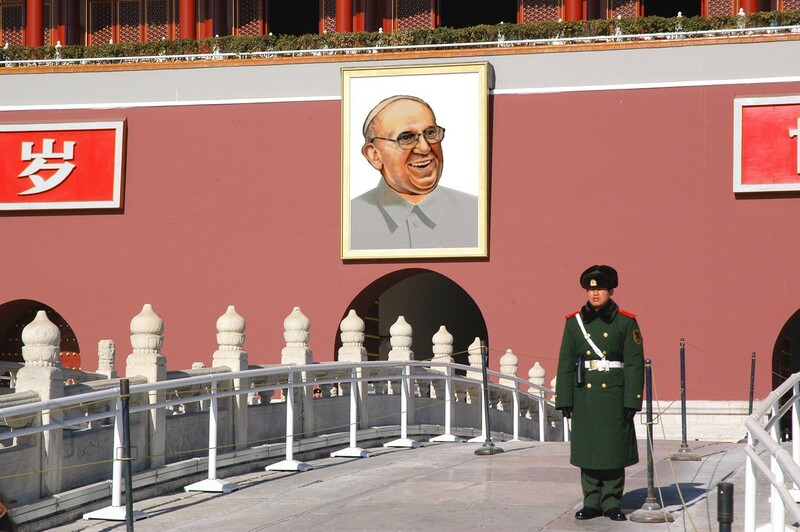 I think President Xi would be open to having the Holy Father come," said Cardinal McCarrick. Did the famously verbose McCarrick let the Siamese cat out of the bag? Was McCarrick suggesting that the Vatican was maneuvering for a papal invitation to Communist China? Is the Vatican willing to throw the faithful underground Catholic Church to the Communist wolves in exchange for a historical papal trip? Cardinal McCarrick obsequiously remarked to the Global Times that the similarities between Pope Francis and President Xi Jinping could be “a special gift for the world.” Tell that to the underground Chinese Catholics who watched in horror as their churches and bibles were burned by the authorities, following the deal. The ChiComms knew they had the upper hand in the negotiations when the Vatican envoy sounded more like a communist party member than a Prince of the Church. McCarrick, like Francis, showed a propensity to curry favor with totalitarian regimes, much like Cuba and Iran. Who could forget the unnerving gesture in 2015, when Pope Francis met Bolivian Marxist President Eva Morales and accepted a crucifix adorned with a hammer and sickle? Incredibly, Sorondo applauded China for implementing Pope Francis’s eco encyclical, Laudato Si “better than many other countries” and praised it for defending the Paris Climate Accord. Sorondo is evidently ignorant of the World Health Organization polluted cities data, which places China as the leader on the list with 287 of the 500 most polluted cities in the world. "A lot of things that China worries about, [Pope Francis] worries about—about the care of poor, older people, children, our civilization and especially the ecology. I see a lot of things happening that would really open many doors because President Xi and his government are concerned about things that Pope Francis is concerned about," the cardinal said. Oh, how touching— just picture the two leaders chatting about the poor, the children (those that survive the China one-child policy) and the climate, strolling along the Great Wall of China! The Vatican is hopelessly naive to trust China’s compliance because it signed the Paris Climate Treaty. Most astute observers scoff at the Chinese climate hypocrisy. This atheistic totalitarian regime rarely abides by any of its agreements or honors its pledges. After the deal was signed, Francis claimed that “both sides lost something in the talks.” Then he casually noted that members of the underground Chinese Church ‘will suffer’ as a result of the deal. Think about that bizarre, harsh and cruel concession by the ‘humble and all merciful’ Pope. Is this Francis’ idea of progress and religious freedom by increasing the pain and persecution for members of his own Church? The “suffering” freely conceded and breezily acknowledged by the Vicar of Christ involves the wholesale surge in coldblooded religious persecution, after his very own negotiated deal. Pray for the Persecuted Church in China. Elizabeth Yore is an international child protection attorney.